Chairman of the Nobel Committee Thorbjoern Jagland looks down at the reserved vacant chair of Nobel Laureate Liu Xiaobo (portrait at left), on which Jagland placed the Nobel Peace Prize diploma and gold medal during the ceremony for the Nobel Laureate and dissident Liu Xiaobo at the city hall in Oslo, December 10, 2010. With the guest of honor held in a Chinese prison, this year's Nobel Peace Prize ceremony was conducted with an empty chair left in Liu Xiabo's absence. The celebration of dissident Liu Xiaobo continues to split the global community and infuriate Beijing. Beijing: Zhongguo guoji guangbo chubanshe, 272 pp. Hong Kong: Tiandi chubanshe, first edition (2008), 1,095 pp. ; eighth edition (2010), 1,208 pp. This article was first published in the January 13, 2011 issue of The New York Review of Books. Each year around the “sensitive” anniversary of the Beijing massacre of June 4, 1989, Ding Zilin, a seventy-four-year-old retired professor of philosophy, is accompanied by a group of plainclothes police whenever she leaves her apartment to go buy vegetables, or to do anything else. Her son, Jiang Jielian, was killed in the massacre by a bullet in the back, and very soon thereafter Ding decided—unlike other parents who had lost children—to defy the government’s demand that the families of victims keep quiet and absorb their losses in private. She organized a group called “Tiananmen Mothers” and, in her speaking and writing ever since, has essentially said to the regime: say what you like, and do what you will, but my mind belongs to me and you cannot have it. (In October, the Tiananmen Mothers called on the Chinese government to release Liu Xiaobo, the imprisoned writer who was awarded the 2010 Nobel Peace Prize and who has been a longtime supporter of the group’s efforts.) Václav Havel, whom Professor Ding admires, called this “living in truth.” To the regime, it makes Ding a dangerous person. Many people have wondered where Ding Zilin got the mental fortitude to confront a vast and potentially brutal government. Even more worth probing, in my view, is what the standoff says about the mentality of her opposition. The Chinese government is the largest in the world. It commands more soldiers than any other government, and owns about $2.5 trillion—by far the most in the world—in foreign exchange reserves. It is widely viewed as an emerging superpower. Nevertheless it sends plainclothes police to accompany a seventy-four-year-old woman as she sets out to buy vegetables. Why? The two books under review here do not have all of the answers to this question, but they illuminate it in profound ways. Today’s “rising China,” which from the outside can seem to exude strength and confidence, inwardly lives with an unsure view of itself. People sense, even if they do not want to talk about it, that their country’s current system is grounded partly in fraud, cannot be relied upon to treat people fairly, and might not hold up. Insecurity, the new national mood, extends from laid-off migrant laborers to the men at the top of the Communist Party. The socialist slogans that the government touts are widely seen as mere panoply that covers a lawless crony capitalism in which officials themselves are primary players. This incongruity has been in place for many years and no longer fools anyone. People take it as normal, but that very normality makes cynicism the public ideology. Many people turn to materialism—whether in property or investment—in search of value, but often cannot feel secure there, either; even if they gain a bit of wealth, they do not know when it might disappear or be wrested away. One stopgap that top leaders have used has been to stoke national pride. They have staged an Olympics and a World’s Fair. They arrange to broadcast throughout China that the Dalai Lama is a “wolf” who would “split the motherland.” Such tactics have had some success. Chauvinist sentiment, especially among the upwardly mobile urban young, is easy to provoke, and is sometimes loudly expressed. here [in China], who knows when all hell might break loose, leaving no place to hide?… Everyone feels this at a certain level but doesn’t say so. Why else would the people who hold all the power in our society be sending their sons and daughters abroad? One reason quotas were too high was that Mao relied on the teachings of the Soviet agronomist Trofim Lysenko, who claimed that rice seedlings could be planted without separating them and that, to cite just one of many other examples, pumpkins could be crossed with tomatoes in order to produce giant tomatoes. Chinese farmers knew such ideas to be nonsense but were in no position to disobey. As a result grain production plummeted at the same time that reported harvests soared. (They could not but soar; the Great Leader had said that they would.) Frightened officials, under pressure to meet and even “overfulfill” their quotas, gathered whatever grain they could find and shipped it to the cities. Peasants who balked at handing over their last stores could be charged with “hoarding,” which was a serious crime. Within three years, between 20 and 40 million people died. Only World War II has taken a larger toll in modern times. What Yang Jisheng adds to this picture is comprehensive scope and authoritative detail in overwhelming amount. When he began research for the book in the early 1990s, he was already a prizewinning senior reporter with the official New China News Agency, a status that allowed him access to archives that were closed to others. He approached his work quietly, in order to avoid suspicion.2 He was able, in the end, to specify such things as exactly how much grain was held in public granaries at the height of the famine (about 22 million tons); how reports of the famine went up the bureaucracy only to be ignored at the top; and how authorities ordered the destruction of statistics in regions where population decline became evident. Yang records how starving people ate tree bark, weeds, bird droppings, and flesh that had been cut from dead bodies, sometimes of their own family members; how they wandered into neighboring counties in search of food, only to find adjacent areas equally destitute, and then, when caught, found themselves charged as “criminal fugitives,” deniers of the truth that “there is no famine.” Punishments for this kind of offense included public humiliation, plus flogging. Parents who left their children at roadsides, hoping that perhaps a stranger might save them, were accused of “assaulting the Party.” As the famine worsened corpses became more visible at roadsides. There was no problem of dogs eating the corpses, Yang notes, because humans had long since eaten all the dogs—and toads, and lizards, and rats. People learned not to kill rats immediately; it was better to tie a string to a rat’s leg, follow it to its hole, and kill it then. That way one could eat the rat as well as dig down into its hole to recover whatever grain it might have stored below. Police guarded county bus stations to prevent people from fleeing. Sometimes entire villages were put under lockdown. In the archives of local post offices, Yang found personal letters that had been confiscated during the famine because they had “cast aspersions on the excellent situation.” And where was all the resistance coming from? It came, said Mao, because “the democratic revolution has not been thorough enough.” “Right deviationists” needed to be punished, and the punishments needed to be public in order to warn others. Yang lists cases of people buried alive or suspended from beams in commune mess halls, and cites countless examples of the severing of ears. Some punishments acquired ghastly sobriquets. To strip a person bare, tie his hands, string him from a beam, wrap him in cloth, douse the cloth in oil, and set it afire was “lighting the celestial lantern.” To bury a living person with the shaved head exposed, then smash the skull to splatter the brain, was “opening the flower.” At times it is hard to read Yang. You have to set the book down, take a break, and come back later. This review omits the most difficult examples. The main reason why the Great Famine continues to haunt China fifty years after it happened is that people are obliged—forcibly, if necessary—to continue to accord the famine’s primary perpetrator, Mao Zedong, a position of honor. Mao’s portrait still hangs at the center of Tiananmen, where it overlooks his embalmed body, which lies supine in his mausoleum within the giant square. And Mao remains the spiritual godfather of today’s regime. Today’s Chinese textbooks and museums omit mention of the famine (noting, at most, “three years of difficulty” caused by “bad weather”), and young Chinese sometimes express the view that vague stories of a famine must be the fabrications of foreigners. Still, many people remember. Inside families that experienced the famine, word passes from generation to generation. What remains largely unknown is how widespread the famine was. People who know that their own family or village suffered terribly may not know that as many as 36 million (Yang Jisheng’s figure) died in other places. If that fact were well known in China, the consequences for Communist Party rule would be severe. The Party’s ban on Yang’s book is not irrational. Hu Fayun’s novel, written in a fluid and graceful style, also looks at the past, at “unofficial history that is not in the textbooks,” and addresses the famine as well as a wide range of other issues: the Anti-Rightist Campaign, the Cultural Revolution, corruption, censorship, the massacre near Tiananmen Square in Beijing in 1989, the SARS epidemic, illegal detention centers, and much else. It also evokes the materialism, cynicism, and narrow nationalism of the current day. An underlying question of “how can we make sense of China’s Communist experience as a whole?” ties the book together. The story tells of Ru Yan, a middle-aged widow whose only son goes to study in France. He leaves her with a computer to help her stay in touch with him. The computer opens to her the world of the Internet, in which she finds unexpected joy and release. It seems to her “like gazing into the starry sky, vast and limitless”; she reflects that here, finally, is the Communist ideal of “to each according to his needs.” But it is not just the Internet’s cornucopian plenty that attracts her; even more important is the freedom that comes from online anonymity. Ru Yan works in a botany research institute, a “work unit” that dates from the Mao era, and the rule in such places, for decades, has been to bottle up your inner thoughts and feelings lest a “mistaken” comment be noted by coworkers and held against you. In cyberspace, exactly to the contrary, Ru Yan finds that people use pseudonyms and say whatever they want, with impunity. “No one sees anyone on the Web!” How liberating. She joins in. Terror itself is nothing to laugh at. But there’s something even more fearful than terror, even harder to take, and that is to see how people end up once terror has passed…. Terror can be more powerful than killing. With killing, merely the body is destroyed; but terror can invade a person’s inner spirit, take over its space, and turn the most refractory rebel into an obedient slave—who then can serve as a model for a crowd of others. Most frightening of all is that terror lives deep inside you, where no one else can help you get rid of it. The senior figure in the handyman’s group is Teacher Wei, a poet and literary critic who was purged in 1955, just before the arrival of the huge disasters of late Maoism. In hindsight Wei is grateful that he was sidelined early. “If I had had smooth sailing back then—had headed confidently in that [Maoist] direction—what might I have become?” He was crushed, though, when his wife left him without explanation, took their two small children with her and completely cut off contact. Only decades later does he learn that she did this to protect him from her own political taint (her family had had Kuomintang ties) and that eventually she, and one of their children, had been driven to suicide. Even our own most personal emotional memories are soaked in an all-encompassing, all-pervading ideological culture…. Within a few decades, they took from us our ability to express suffering and sorrow. They took our ability to express love. What they gave us instead were fraudulent stand-ins…. Even today we do not have an authentic, untainted cultural vehicle with which to record our lives…. Other countries have it. Even the poorest and most backward countries have it. But the country with the largest population and the longest history on earth does not have it—you have to admit there is something horrifying about this. The long-term effect on our nation’s psyche is still something that no one can measure. This is why the regime is happy to see commercial performances by third-rate crooners from Hong Kong and Taiwan occupy China’s stages: it blocks out songs that might truly express people’s sufferings and hopes. “Your generation is different from my father’s,” said Ru Yan, laughing. “What they said outside the house was the same as what they said at home,” she said. “So you can see we’ve made progress,” he replied. In the end, Liang himself comes to see that the match with Ru Yan will not work. Part of the appeal of Hu Fayun’s novel to Chinese readers seems to have been Ru Yan’s very attractive character. In the frenzy of initial Internet comment on the novel, readers wrote that they adored Ru Yan for being “what China needs” and “the way a person should be.” Here, if we stand back for a moment, is some good news to balance all of the evidence for moral rootlessness in today’s China. A fictional character whose most apparent traits are modesty, integrity, and common decency has become a champion to readers. This may reflect, on the one hand, how scarce these simple virtues are in readers’ daily experiences; but it also shows the strong popular thirst to see precisely these kinds of values reemerge. Does popular admiration for Ru Yan’s character have anything to do with why plainclothes police accompany Ding Zilin to buy vegetables? I think so. What would happen if, somehow, open rebellion were to break out in China? Or a domino effect of the kind that led to the collapse of the Soviet Union were to occur? If Chinese people were truly in a position to choose, how many would say yes, this political party has safeguarded our nation and protected our cherished values for sixty years, and we will stand up for it now, in its moment of crisis? Would the people who admire Ru Yan’s character say that? Would the people who remember the Great Famine say that? Would the people who cause “mass incidents” (the government’s euphemism for strikes, demonstrations, roadblocks, etc., the numbers of which have grown to hundreds of thousands in recent years) say that? Would even the beneficiaries of Party policies—the wealthy and well-connected—stick with the Party instead of heading for safety in places like Vancouver? “Stability maintenance” means monitoring people—petitioners, aggrieved workers, professors, religious believers, and many kinds of bloggers and tweeters on the Internet—in order to stop “trouble,” especially any unauthorized organization, before it gets started. In the last fifteen years a popular movement called “rights maintenance” (weiquan) has spread in China. The government cannot come out explicitly against “rights,” because that would cause too much loss of face. “Stability maintenance” is clearly its response. Even at the linguistic level, weiwen has been designed to counter weiquan. Here lies a Chinese person who did some things that were right for a person to do, and said some things that were right for a person to say. Liu himself had chosen the words. The cemetery staff agreed, but returned a few days later to tell the family that those words could not go onto the tombstone. Their “superiors” had said no. Nothing but Liu’s name and dates could appear on the stone. The superiors offered no explanation, but it seems clear that fears of “instability” must have been the reason. (What if someone were to lay flowers? What if several people did? What if a group formed?…) After deliberation the family decided to withdraw its request for the inscription, bide its time, and hope for a day when the stone might be able to appear as it should. For now the stone remains blank. Inadequate as a monument to Liu, it stands, in another sense, as an astute comment on today’s Chinese government. How can one capture, in brief, the odd combination of visible power and inner weakness? This wordless stone, in the end, might say it best. Countries that have embassies in Oslo were invited to send representatives to the ceremony, but the Chinese government had aggressively called for a boycott. In the end, forty-five countries attended, but another nineteen—including Russia, Pakistan, Cuba, Saudi Arabia, Iraq, and Vietnam—chose to stay away. How much their decisions were motivated by sympathy for the Chinese government’s position and how much by pressure from China over matters of trade and diplomacy is impossible to measure. From the United States, House Speaker Nancy Pelosi attended, along with Representatives David Wu of Oregon and Chris Smith of New Jersey. When he had finished reading these words the audience of about a thousand people interrupted with applause. The applause continued for about thirty seconds and then, when it seemed that the time had come for it to recede, it suddenly took on a second life. It continued on and on, and then turned into a standing ovation, lasting three or four minutes. Jagland’s face seemed to show an expression of relief. After the ceremony, in a news interview, he said that he understood the prolonged applause not only as powerful support for Liu Xiaobo but as an endorsement of the controversial decision that his five-person committee had made. In the remainder of his speech Jagland stressed the close connections among human rights, democracy, and peace. He reviewed the four other occasions in Nobel history when a Peace Prize laureate was prevented from traveling to Oslo: in 1935, the Nazis held Carl von Ossietzky in prison; in 1975 Andrei Sakharov was not allowed to leave the USSR; in 1983, Lech Wałe˛sa feared he would be barred from reentering Poland if he went to Oslo; and in 1991, Aung Sang Suu Kyi was under house arrest in Burma. Even so, each of the latter three laureates was able to send a family member to collect the prize. Only Ossietzky and now Liu Xiaobo were prevented from sending a family member. Jagland stressed that his committee had great respect for the Chinese nation, and observed that support of dissidents makes countries stronger, not weaker. The US had become a stronger nation because of the work of Martin Luther King Jr., another Nobel Peace laureate. I am serving my sentence in a tangible prison, while you wait in the intangible prison of the heart…. But my love is solid and sharp, capable of piercing through any obstacle. Even if I were crushed into powder, I would still use my ashes to embrace you. The reading was followed by songs from a Norwegian children’s choir. Liu Xiaobo had requested, through his wife, who met him in prison on October 10 and was free to make phone calls until she was placed under house arrest on October 18, that children participate. 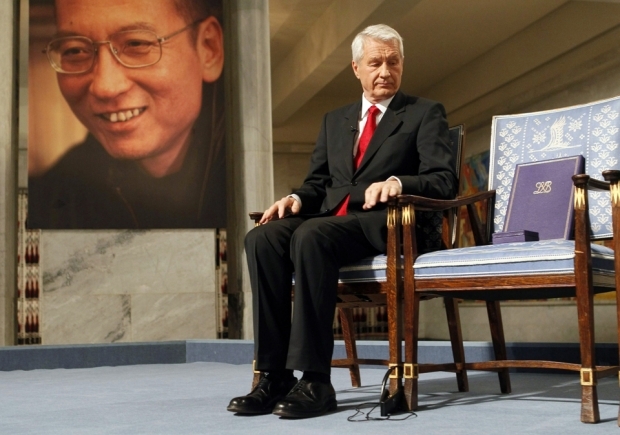 The climactic moment of the ceremony came when Jagland, unable to hand the Nobel diploma and medal to Liu Xiaobo, placed both upon the empty chair where he was supposed to have been sitting. Liu knows that the greatest potential for his ideas, and the most important effects of his Nobel Prize, will unfold inside China. China’s rulers have consistently denounced his Charter 08 as “un-Chinese,” even while they assiduously prevent its publication inside China, apparently from a fear that ordinary people, were they to read it, might not find it so un-Chinese. The Internet is porous, and the Nobel Prize will certainly make Chinese people curious to learn more about Liu Xiaobo. While others shared this kind of optimism, for many fear persisted as well: it is just too hard to say which side will win. At a happy gathering in the mid-afternoon of December 9, for example, Renée Xia, the overseas director of China Human Rights Defenders, received an urgent phone call from Beijing. Zhang Zuhua, who had been Liu Xiaobo’s main collaborator on Charter 08, had just been abducted by plainclothes police on a Beijing sidewalk. When the police took him away they told his wife it would “probably be only two or three days,” but of course they both worried about the “probably.” He was brought in a car that had curtains on the windows to a Public Security guesthouse near Beijing. He doesn’t know where it was, except that he could “see mountains” outside. He was allowed to read but was held in a room that had no electric light, so when the sun went down reading stopped. He was allowed to go out into the sitting area with the police to watch television and chat and to stroll in the courtyard with the policemen. This was only hours before the Nobel ceremony was to happen. It may have been that the authorities wanted to eliminate any possibility of a telephone hookup to Oslo. In any case they gave no reasons. Zhang was held until December 12, and then was allowed to go home. But when this happened to Liu Xiaobo two years earlier, the eventual sentence was eleven years. One never knows what will happen. the current strategy works. The formula “money + violence” works, and we stay on top. We know what the world means by human rights and democracy, but why should we do that? Aren’t we getting stronger and richer all the time? Twenty years ago the West wasn’t afraid of us, and now they have to be. Why should we change what works?